Born in Liverpool, David went to school in Aigburth and in his early years football was his passion. Captaining his school football team and playing against players such as Steve McManaman and Robbie Fowler amongst others. During a holiday in the 1990s in Barcelona, whilst visiting the various tourist attractions he visited Antoni Gaudi’s Park Guell which is where his passion for mosaic art was first founded. 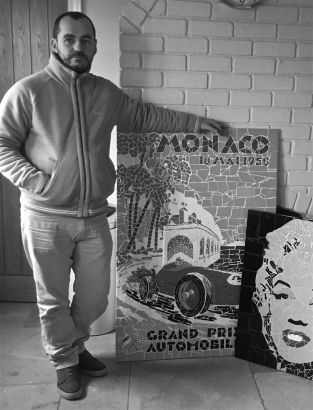 David likes to make mosaics that are influenced by his own passions such as iconic music album covers, fine works of art, rare racing cars, retro posters and iconic buildings. His attention to detail, discipline and patience are paramount in producing each artwork. Every mosaic work is totally unique and made with great attention to detail. He is not happy unless he would be happy to display each completed work in his own home. He love’s each and every stage from the initial idea through to completion but often changes things during the process.